Since 1976, the Kowloon Rugby Football Club has shared and cultivated a love of rugby within the surrounding community of Hong Kong. 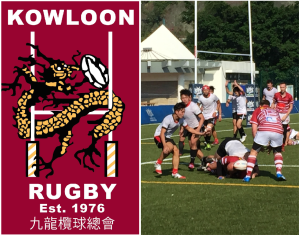 In addition to its nine rugby teams and five netball teams, Kowloon RFC is known as Hong Kong's most social rugby club and also supports several charitable endeavors around the city. 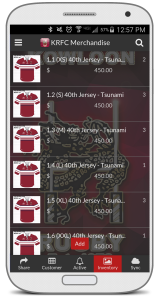 When matches take place, Kowloon RFC administrator Johnson Harvey is responsible for logistics support, inventory management, and sales of club merchandise. KRFC sells merchandise on its website. At the outdoor matches, Johnson must be accountable for sales and stock and must be able to answer questions about inventory immediately. He was using Google Forms to keep track of sales and inventory, but this method didn't allow him real-time insights into merchandise availability and sales reporting. Having this information on hand was critical to KRFC's operations. Johnson found AppSheet and created an app he could use to conduct the inventory and sales processes while on the field. The app keeps track of stock and maintains a record of sales transactions, customer details, and more. It utilizes references to link information from three tables: Orders, Customers, and Order Details. When a user clicks into a customer from the "Customer" view, he then has the option to view open orders for that customer. In the "Inventory" view, users can click on products and then see how many orders have been made for that product. Johnson says the app is especially useful when someone on the field wants to know if a certain product is available. "I will have a definite answer after checking with the app [on the field] and not have to go through the entire store room hoping there really is an XL jersey somewhere in the room." "It is great to be able to customize the look and feel of the app with our club's logo which builds our team identity."